New York-based leader in upscale skin care Janet Sartin is debuting a specially formulated scrub that uses natural exfoliants to remove dead and dry skin cells for brighter skin. 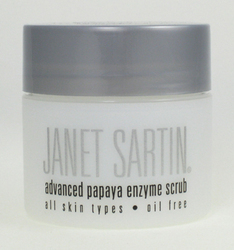 Janet Sartin, the leading skin care company based in New York, is introducing its latest skin care product, Advanced Papaya Enzyme Scrub, to their sophisticated line of anti-aging solutions. Available at Sartin.com, the Advanced Papaya Enzyme Scrub is formulated with 100 percent natural exfoliants, including walnut shell powder, apricot seed and papain to gently remove dull dead and dry skin cells revealing a glowing, brighter and skin. The scrub is for use on the face, neck and décolleté. Throughout the company's 50-plus-year history, the facial beauty products authority Janet Sartin has consistently produced tangible results with its beauty products, says company namesake Janet Sartin. Sartin believes that maintaining one's appearance is essential; with that in mind, the skin-care leader developed the oil-free Advanced Papaya Enzyme for all skin types. Results are immediate and it can be used with both dry skin products and oily skin products. Individuals who begin showing signs of dull looking skin should "drink plenty of water to hydrate and supply nutrients to your skin," Sartin said. "If you smoke, quit smoking, which kills skin cells and destroys collagen. "Avoid overexposure to the sun and use a high SPF sunscreen when outdoors," she adds. For skin that appears dull and needs exfoliation, Janet Sartin offers several exfoliating options to give skin a younger appearance. In addition to the new Advanced Papaya Enzyme Scrub, the company offers natural anti-aging solutions such as the salon strength 30% Resurfacing AHA Gel Glycolic Acid Peel, which improves dry skin, oily skin and acne prone skin. The peel reduces the appearance of fine lines, wrinkles, flaky patches, sun damage and uneven skin texture. Additionally, Janet Sartin's 3% Glycolic Acid Facial Cleanser, a recommended cleanser for all skin types, is formulated with glycolic acid technology in a cleanser that also reduces lines and other age signs. The solution clarifies and dissolves dull flakes, oils and debris, leaving skin glowing. Sartin advises customers to "use preparations that do a specific job for your skin." Janet Sartin's facial treatments offered in New York have gained notoriety from high-profile clients, and are sought after by the most famous, stunning and powerful women in the world. Janet Sartin's most famous facial treatments, which include the Signature Facial Treatments, Crystal Exfoliation Treatments, and GentleWaves Skin Rejuvenation Treatments, are highly effective anti-aging treatments. For more information on Janet Sartin's New York Skin Care Institute, or to purchase products online, visit the Janet Sartin website. Janet Sartin has more than 50 years of experience creating her exclusive line of trusted and reliable skin care solutions for her discerning clientele. Her oily skin products promote a healthy and radiant appearance while treating acne and blemishes. Janet Sartin encourages New York residents and tourists to visit the Janet Sartin spa in NYC for a New York Skin treatment and to discover how beautiful skin can be with Janet Sartin. For more information, visit Sartin.com. 3% Glycolic Acid Facial Cleanser:Oil-free clarifier leaves skin glowing. Resurfacing AHA Gel:Janet Sartin's resurfacing gel reduces fine lines and uneven skin texture.